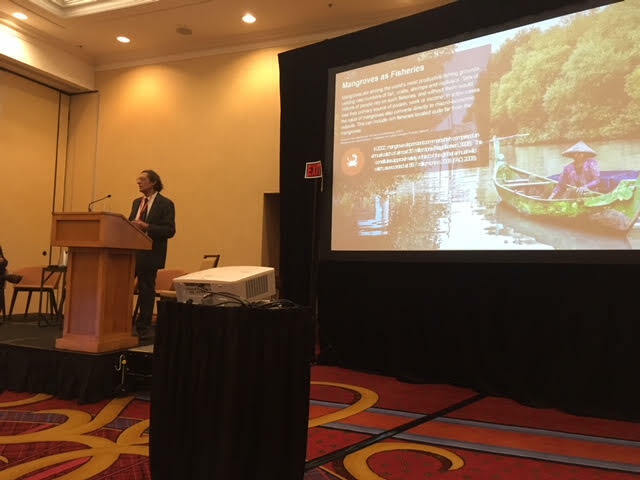 We would like to thank you again for being a panelist for the "Coastal Infrastructure, Extreme Weather Events, Green Infrastructure and Blue Carbon" session of the World Ocean Council’s 5th “Sustainable Ocean Summit” (SOS 2017) in Halifax. The SOS 2017 wouldn't have been possible without your participation, presentation, and expertise. Thanks to your involvement, the SOS 2017 was a solid success. The event brought together over 225 ocean leaders from across the ocean industry sectors and stakeholder communities from around the world, with 28 nationalities represented. We hope the presentations, panels and discussions sparked by the different SOS sessions were valuable for you. We also hope that the SOS increased your understanding of the important, unique role of WOC in bringing together the diverse ocean business community (and other stakeholders) to focus on the challenges and opportunities of ocean sustainable development. With this in mind, we hope that you will let your peers and colleagues know about the important mission and efforts of the WOC and the unique role and value of the SOS in bringing the ocean business community and stakeholders together. We warmly invite you to participate in the 6th Sustainable Ocean Summit (Hong Kong, 14-16 November 2018), which is already shaping up to raise the bar further on international business leadership and collaboration for ocean sustainable development. 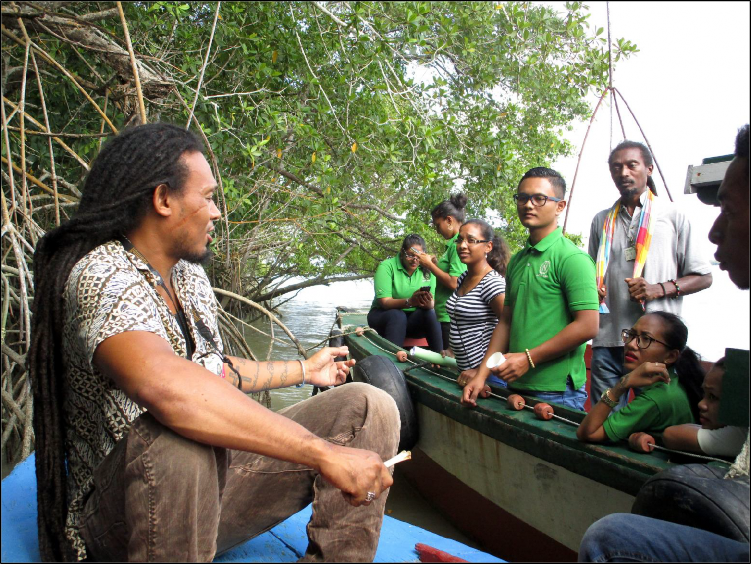 Tour guides Yves Tjon (left) and Errol Gezius from the United Tour Guides Association of Suriname (UTGS) with trainee tour guides on the banks of the Suriname River with a field trip from an in-depth Marvellous Mangroves training program. During the past two decades there has been a steady growth in mangrove ecotourism as more and more people people discover the hidden beauties of the world’s mangrove forests. As selected parts of the Marvellous Mangroves curriculum have been used to supplement the knowledge of the guides, the concerted focus of the October mangrove tourism workshops held this year in Suriname have added a new dimension to the tour guide training process. MAP Education Director Martin Keeley joined forces with the United Tour Guides Association of Suriname (UTGS) and the Foundation for Development of Radio and TV in Suriname (SORTS) to hold two workshops. The first 3-day workshop was held in Coronie, home of the amazing Mangrove Education Centre, and the second in New Amsterdam, Commewijne, on the opposite side of the Suriname River to Paramaribo. 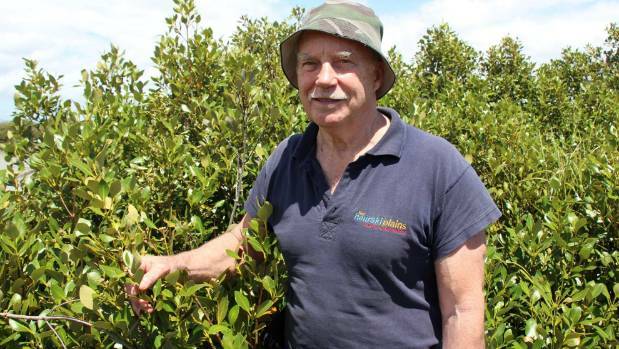 In 2016 UTGS directors led by Errol Gezius and Yves Tjon, together with Sherida Mormon of the NGO Advice For Innovation & Business Creation (ABIC) took part in a teacher/student MM workshop in Coronie as well as a one-day introductory tour guide mangrove workshop led by Martin Keeley. This began the drive towards a second series of workshops in July, 2017, which are part of the training of young eco-tour guides in the Coronie region of Suriname. The October workshops, funded by the World Wildlife Fund (WWF) Suriname, expanded to integrate the concepts of tourism- a basic “how to” for the young guides – with a more in-depth series of Marvellous Mangroves activities. The latter part of these workshops involved the use of four microscopes donated this year to the Education Centre by MAP, as well as intense field trips. 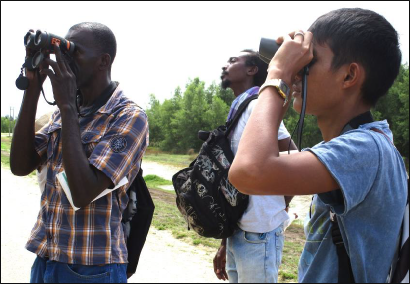 Trainee mangrove eco-our guides at Coronie, Suriname, bird watching – a great blue heron! well as their relationship with the community which relies on them for such things as fishing and honey production. “Don Foster is a well known and loved guide of the tour,” Ms. Laing continued. “Don has always been involved in watersports in the Cayman Islands - he is one of the pioneers in the dive industry on the islands. Don was also The Cayman Islands Marine Conservation Board Chairman for many years and worked on developing The Caymans Islands Marine Parks System.” She adds that the mangrove eco tours provides an authentic Cayman experience that encourages the small group experience, high safety standards, and environmentally sustainable practices and tours. 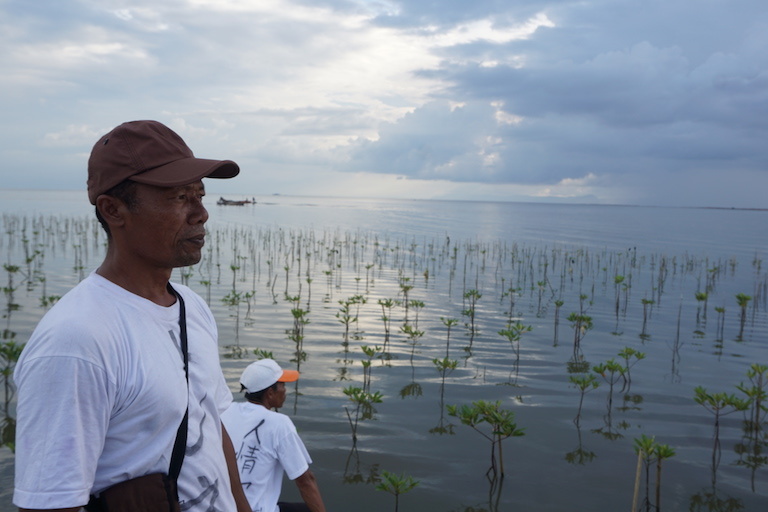 greater appreciation of the importance of the mangrove community and why it’s vital to take steps to preserve what is left. 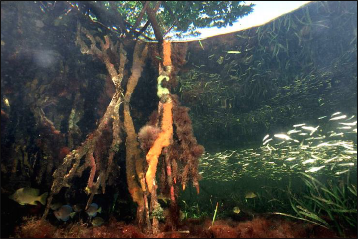 Interactive tours allow an exploration and observation of orange sponges, sea squirts, and anemones that cover the mangrove roots, the secretive seahorse which is even visible from a kayak, and see the beauty under the mangrove canopy. Victor Serpulveda (left) runs a mangrove eco-tour guide service exploring mangroves on San Andres Island, Colombia, while his associate, ValVal Davis, takes MAP’s education director, Martin Keeley, explores those mangroves via a kaya expedition. 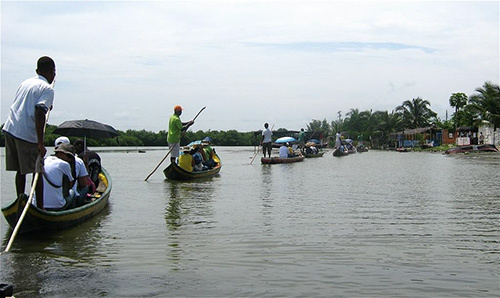 Fishermen from La Boquilla village in mainland Colombia, take tourists from nearby Cartagena hotels on a mangrove boat trip close by their village. The fishermen find it a lucrative way to supplement their income from fishing. The kayak excursion includes a lesson with an experienced guide followed by play time on the water as the guide takes guests across a harbor of calm waters to the mangrove forest. 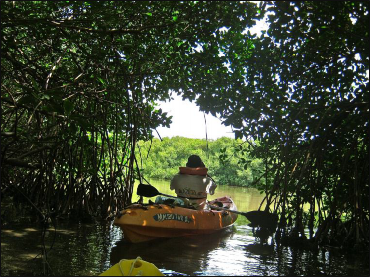 The basics of mangrove ecology are explained and explored while paddling and getting a great vantage point to see local birds, baby fish, starfish, and tree-climbing iguanas. Marvellous Mangroves has also triggered and supported mangrove ecotourism in countries as far afield as Brazil, Cartagena and San Andres, Colombia, Bangladesh and China. 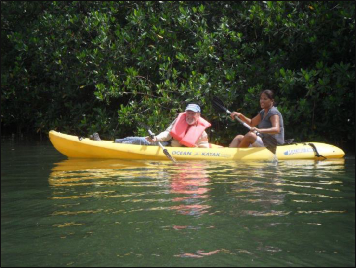 Some six years ago, on San Andres Island in the Caribbean, Victor Serpulveda and ValVal Davis, took MAP’s Martin Keeley on a guided kayak tour of that islands’ mangrove forests. The difference being that Victor has introduced transparent acrylic kayaks so that you feel like you are part of the mangrove root ecosystem because there’s nothing between you and the undersea mangrove-scape. And you don’t even get wet! 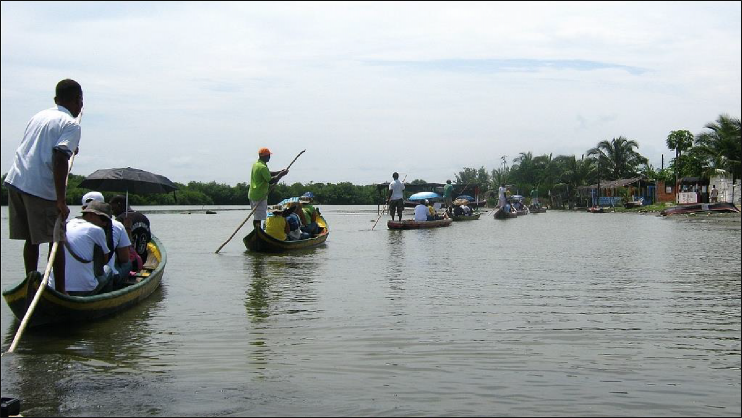 Across the Caribbean in Cartagena, on mainland Colombia, the fishermen of La Boquilla village close-by the city have formed two mangrove tour guiding companies, Los Arriberos and Ecotours Boquilla, which successfully supplement their income from fish! 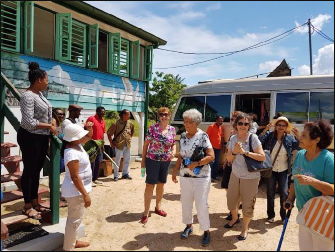 Leaders and teachers of the village attended Marvellous Mangroves workshops started by MAP and local NGO Eco-Progresso ten years ago where they received – and continue to receive - detailed information about the eco-system to demonstrate to their tourists. Chinese tourists exploring the mangroves in Shenzhen mangrove park, China (left) and greeting the tour bus at the Coronie Mangrove Education Centre, Suriname, prior to their tour of that town’s mangroves. 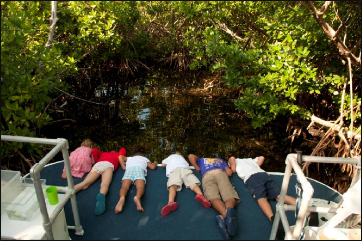 Left: Tourist kids check out the wonderful underwater world of mangroves in the Cayman Islands. Right: what they see! In many parts of the world mangrove education in the field usually comprises a boardwalk, a poster or two and a couple of explanatory signs. 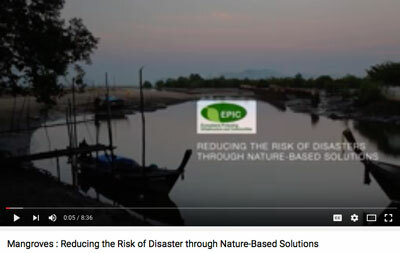 That is not enough if an in-depth understanding of mangrove ecosystems is to be fully understood. In Shenzhen, PRC, for example, the Shenzhen Mangrove Foundation 9SMF0 has taken over operation of two city parks with mangroves and uses many of the techniques learned from Marvellous Mangroves teachers and employees workshops three and four years ago. SMF continues to run both Marvellous Mangroves workshops and training sessions. 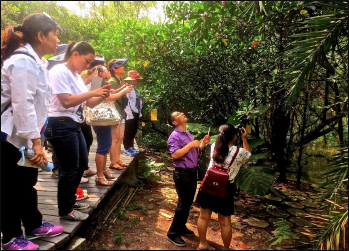 The Chinese Mangrove Conservation Network (CMCN) based in Xiamen has also been following the Marvellous Mangroves method of introducing mangrove ecology to tourists. 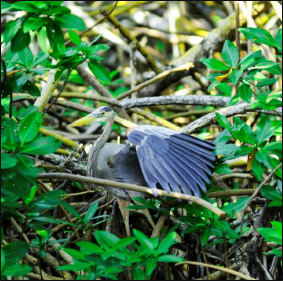 These include CMCN-led visits to Crocodile Island from the coastal city of Xiamen focus on all aspects of mangrove ecology – running the gambit from bird species identification to the studying the species of insects found on the fascinating island. CMCN trainee tour guides have also participated in extensive Marvellous Mangroves workshops in that city starting in 2011 and continuing over the past several years. The second edition of Marvellous Mangroves Myths & Legends is hot off the press and already selling out fast. 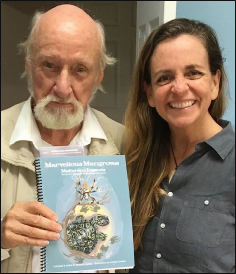 Writer Martin Keeley has donated copies for use in every Year 5 classroom in Cayman schools. 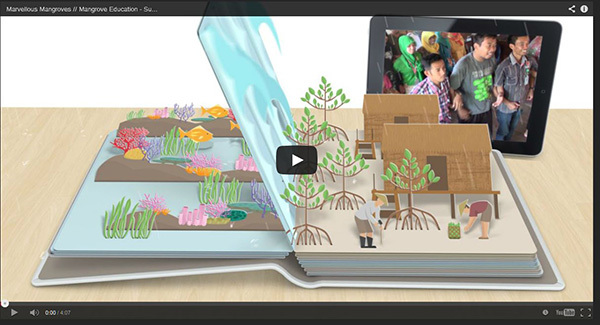 the Marvellous Mangroves education program in each of the schools this year = sponsored by CUC. Mr. Keeley reports that a French translation of the book is already underway and will be launched this spring. He plans to take copies when his visits French Guyana during his Spring break. The international theme for World Wetlands Day 2018 is 'Wetlands for a sustainable urban future'. Urban wetlands make cities liveable in many important ways. They reduce flooding, replenish drinking water, filter waste, provide urban green spaces, and are a source of livelihoods. 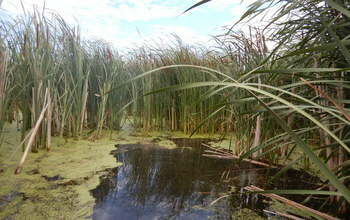 Urban wetlands should be integrated into a city’s sustainable future planning and development.